Stairs leading to the Visitor Cener's back door effectively bar people with disabilities from gaining access to restrooms on weekends. By locking the front door of the Visitor Center in Thompson Park on weekends but leaving the back door open for restroom access, the Monmouth County Park System is likely violating federal law, a spokesman for the U.S. Department of Justice said Tuesday. That's because the back door of the Middletown park building is at the top of an eight-step stairway, making the restrooms inaccessible to some people with disabilities, especially those in wheelchairs. The park system cannot open the facility on weekends — the busiest visiting days in summer — "yet close the only accessible entrance to it" without violating standards of the federal Americans with Disabilities Act, said Eric Holland of the U.S. Department of Justice. His is the agency that enforces the regulations of the disability act. Holland said that in order to comply with the law, the Park System must provide an entrance accessible to all visitors if it opens the building at all. 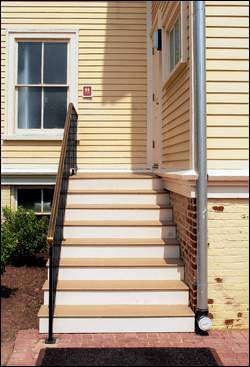 The front entrance has a ramp. Laura Kirkpatrick, the parks' public information officer, said there are no plans to open the front entrance on weekends. "There are restroom facilities at the Craft Center (in the park) that are handicapped-accessible," Kirkpatrick said of another park building at the park's western end. However, there is no sign at the Visitor Center advising people about the other location. And there are no paved public roads connecting the two buildings. Visitors would need to drive outside the park and re-enter at a different entrance on Newman Springs Road. Kirkpatrick added that since the Visitor Center also houses park employee offices on the second floor, there are security concerns with opening the front entrance on weekends. "You can't just open and let people walk through," she said of the building, which was recently renovated by the county at a cost of $3.6 million. "County officials should know better," said Carolyn Schwebel, a Middletown resident who uses both a cane and a wheelchair to get around. Schwebel, who recently filed a lawsuit charging that Monmouth County violates ADA access regulations at seven other county buildings, said she checked out the VisitorCenter last weekend after an Asbury Park Press story reported the building is closed on weekends. In addition to not having a ramp, "there are also supposed to be two handrails along the stairs," she said of the back entrance. There's only one handrail. Park officials "probably just didn't think about wheelchairs when they decided to leave the back door open," said Jim Marzano, 70, of Union Beach, who has used a wheelchair his entire life. "Why don't they just unlock the front door on weekends? That would fix things." Kirkpatrick, the parks spokeswoman, said that won't happen until sometime in October, when the park celebrates Thompson Park Day with an exhibit in the Visitor Center. And there's no guarantee that after that, the park will keep the Visitor Center open on weekends. "We plan to monitor attend-ance and see what kind of visitation we have," she said. "We may just open it seasonally." Kirkpatrick said park officials did not consult with the director of the county's Office on Disabilities, Alexander Buono, about access to Visitor Center on weekends. Buono could not be reached for comment. Kirkpatrick said park officials also did not contact federal authorities to see if the practice of leaving the center's back door open complied with ADA regulations. Instead, she said, an "internal committee" made the decision that the park system was not violating ADA guidelines. Dave Yanchulis, an accessibility specialist with the Access Board, a federal agency that maintains accessibility design standards, agreed that weekend access at the Visitor Center is likely in violation of federal law. Stan Soden, a coordinator for Moceans, a "center for independent living" in Long Branch, said he is surprised by the county's noncompliance. "I've been to a number of county parks, and they are relatively accessible in terms of the restrooms," said Soden, who uses a wheelchair. Pat McShane, the executive director of Moceans, said the organization may contact both the county and the Department of Justice about the issue. "We'd just like to make sure (the county) is in compliance" with ADA regulations, she said.